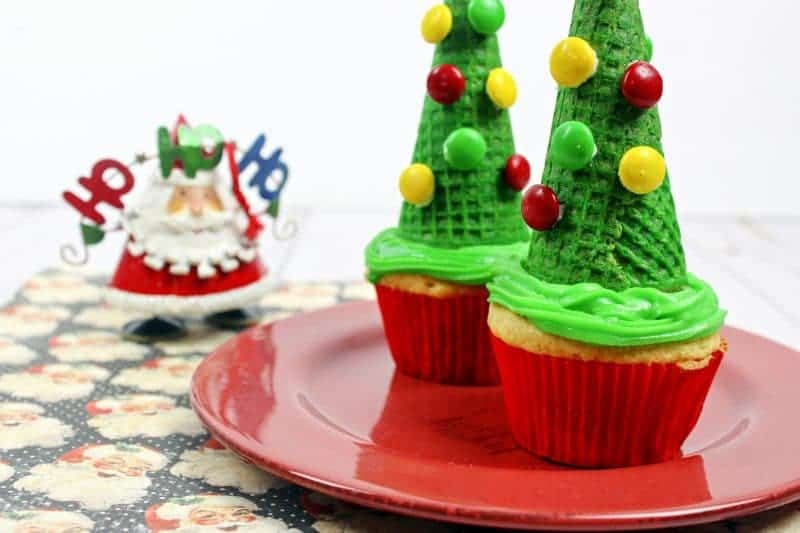 These fun Christmas tree cupcakes are easy to make by topping cupcakes with sugar cones and then decorating them with M&Ms as ornaments. 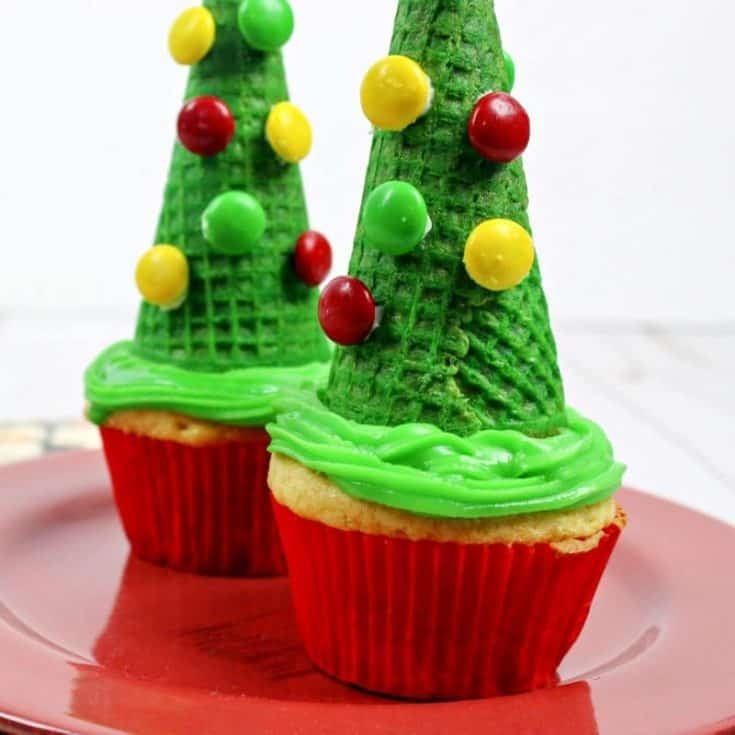 Are you looking for another fun Christmas ice cream cone cupcake for your kids to make this Christmas? 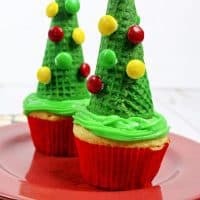 These Christmas Tree Cupcakes are so much fun to make and kids will have a blast decorating them. You can start with cupcakes made from a cake mix and use store-bought frosting. You don’t have to spend a lot of time baking – it’s all about the decorating. 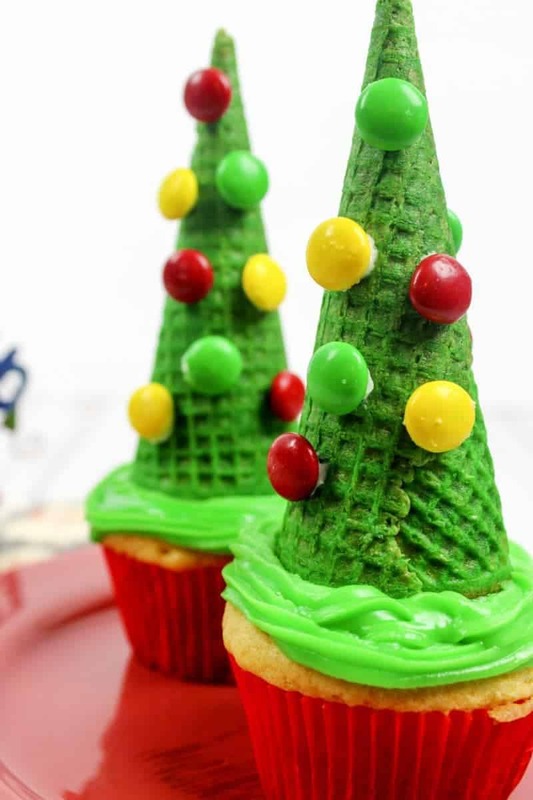 You are only limited by your creativity when it comes to decorating these Christmas tree cupcakes. This recipe serves as a guideline, but there are so many fun things you could do. For example, you could use different kinds of candy as ornaments. 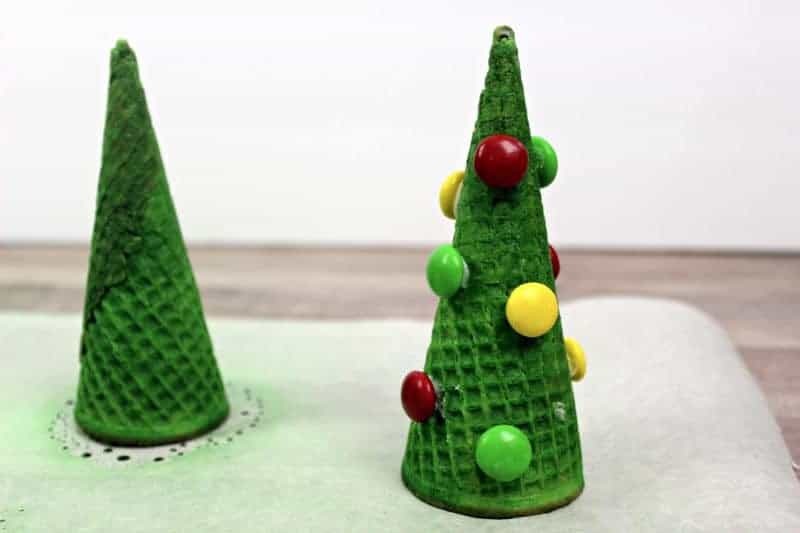 You could also dust the cones with powdered sugar before the spray dries to give the cones the look of being snow covered. Just have fun with it. If you’re part of a bake sale, these are a must. These will sell out so fast that you’ll wish you had made more. People simply love creative treats like this. They’re fun and put everyone in the Christmas spirit. So go ahead and get the kids in the kitchen and start baking. Let them have fun decorating their Christmas trees with candies as ornaments. Your kids will absolutely love making these and you’ll love the memories this activity creates. If you are using vanilla frosting, add the frosting into a bowl, add green food coloring, and mix until desired color of green is reached. Or, use this green cupcake frosting. Then, pipe the green frosting onto the cupcakes and then set aside. Next, spray the sugar cones with green color mist. Set aside and allow to dry. 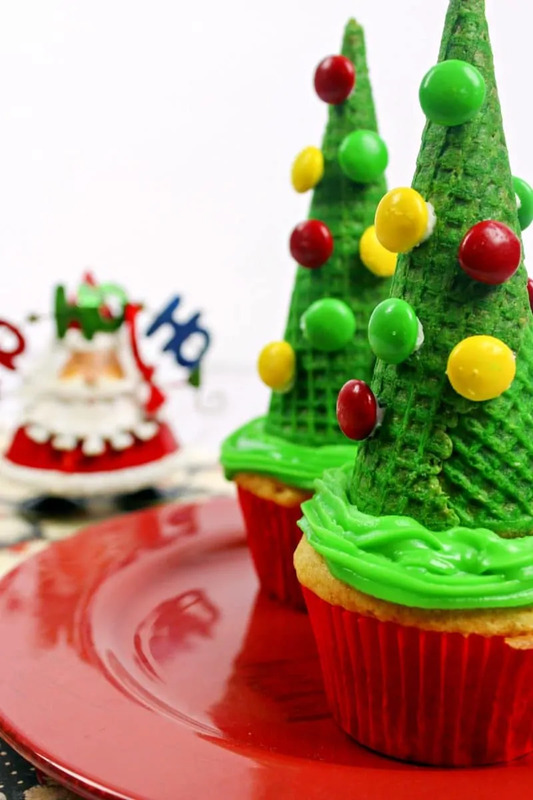 Once the sugar cones (Christmas trees) are dry, place a dot of frosting on the back of an M&M and then place it onto the tree to act as an ornament. Repeat, placing about 10 M&M's on each “tree”. Finally, place each sugar cone on top of the a frosted cupcake. That's it! I hope that you enjoy this easy Christmas treat with your family and that you have a very Merry Christmas! If necessary, add store bought frosting into a bowl, add green food coloring, and mix until desired color of green is reached. Or, use green cupcake frosting. Pipe green frosting onto the cupcakes and then set aside. 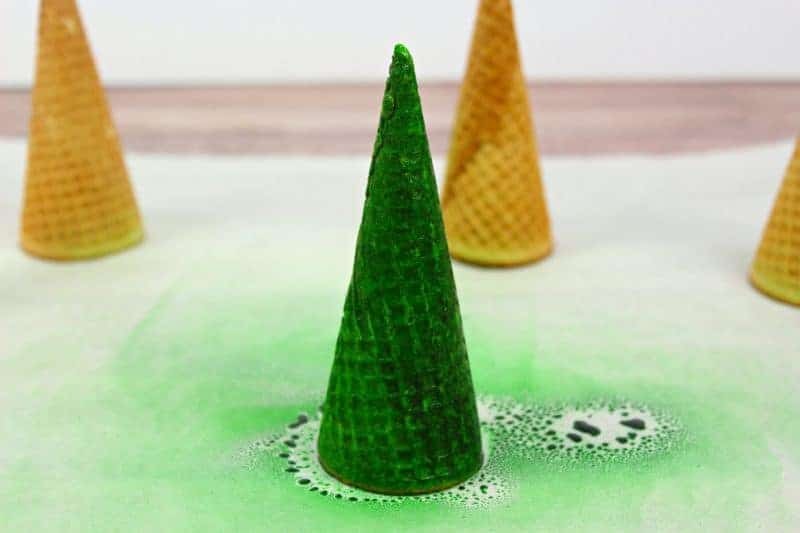 Spray the sugar cones with green color mist. Set aside and allow to dry. 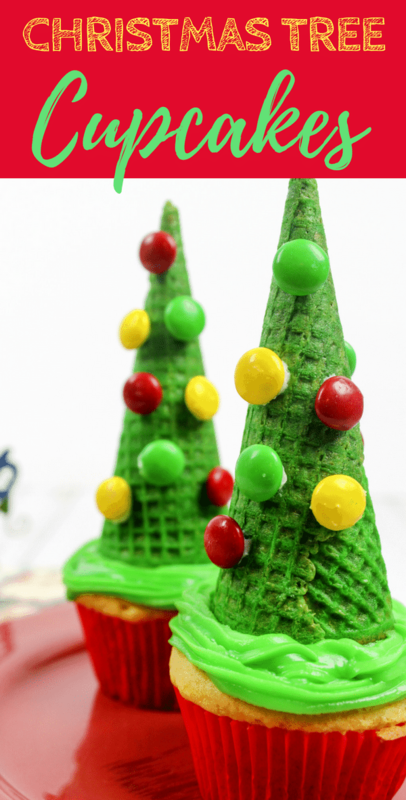 Once the sugar cones (Christmas trees) are dry, place a dot of frosting on the back of an M&M and then place it onto the tree to act as an ornament. Repeat, placing about 10 M&Ms on each "tree". Set a sugar cone on top of each frosted cupcake. Omgosh these are too cute!! My son would have SO much fun helping me decorate the trees!! Love this idea and I never knew that had edible color mist spray! These are so cute. 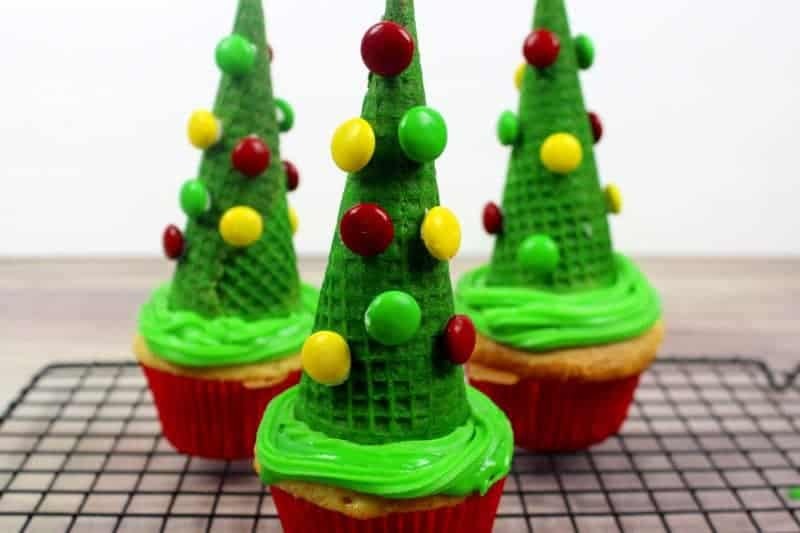 I would love these for a dessert at Christmas. This is such a great idea! I had no idea that edible color spray existed, I am going to have so much fun with this! 🙂 Thanks for sharing. I know I am going to let my kids do the candy decorating! This is a fun Christmas dessert. This is such a good idea! I can just imagine adding something to make them sparkley! My kids are gonna love it! These are so cute,I can’t wait for my grandson to be old enough that I can bake goodies for him! So glad to have seen this. It’s a new one for me and these would be cute to send to the children’s school holiday party. These are too cute! My 5 year old goddaughter would love to make these with me. These are just too cute! I will have to make these with the grands. I never would have thought to use an ice cream cone to make a tree. These are perfect for a Christmas party! I am making these tomorrow! Thanks! I LOVE these cupcakes! I will enjoy making them with my nieces and nephews! This looks like a deliciously cute idea. Yum!